True story......The fisherman is on deck, fly in hand and more line stripped out than he can cast. The guide yells, "11 O'Clock, 45 feet!" The fisherman reels up, hooks his fly on a rod guide, and sits down. He heard, "It's 11:45, let's eat!" The most common question I get is....When is the best time of the year to come? The fall, easily, without a doubt. Last fall proved to be the best one yet with high fish counts and very few refusals. Why? 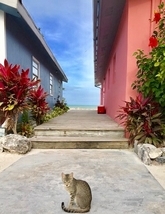 The weather is great with hurricane season all but over and cooler days. It's well before the winter cold fronts begin. The fish have had all summer to get stupid. They have not seen a boat or a fisherman since the previous May. This fall 2018 is almost booked up, just a few slots open in Oct and mid-Dec. CLICK HERE for more FAQ's. We are running all new motors and a new boat. We tow a few boats home every year for other lodges on South Andros. In 16 years we have never had a boat not get home under it's own power, we have never had a single boat towed. The lodge is in the best shape it's ever been in...all new AC's, new tiled showers, new beds, furniture, paint. Things nobody will notice. Same house staff, same guides. In other words, experienced staff and well-maintained accommodations and equipment. Pics below are of several fish caught this season, running out of room. Three of those fish were caught the day before and the day of the March super moon. 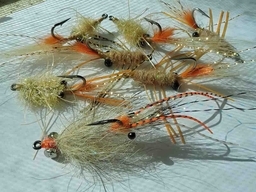 Crab and shrimp patterns have been the most productive this season on South Andros. Gotchas in pink, tan, and pearl are always a good choice.....A 9 weight rod loaded with a 10 weight line is a deadly tool on a windy day....Click here for more info about flies and tackle. Bahamas Bonefishing has never been better. 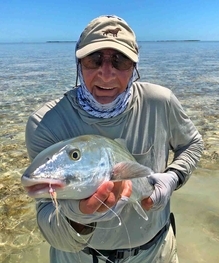 The 2019 season has easily produced more trophy bone fish than in any previous year since Mars Bay Bonefish Lodge opened 18 years ago. Every day fishermen report legit shots at fish 10lbs plus. They didn't get big by being stupid, they're hard to catch. But every week we get one to three in the boat. Of course, most are just fish stories without the pic. Tom Bozzuto landed the 12ish fish pictured left and Joe Nourigat's fish is a solid 10lbs on the right. Dreaming of wading endless flats on a warm day? Got a question? Drop us a note. We're glad to help. Click here. Custom Fly Rods!!! I seen a lot of rods come through this lodge. This gent builds the best I've ever seen; name brand blanks, titanium guides, no-slip graphite handles, whatever you want. A custom rod makes a great gift, or better yet, an investment in your happiness. Tying your own flies? Want to match the hatch? 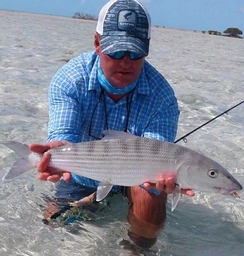 Or are you just curious to see what bonefish feed on...Click here. Any spellin mistakes on this website are all entirly my falt. Any grammer errers therefour spotted therein in this website were put there because I could. Opinions expressed on this website are my own and generally unpopular with others. This website contains no CFCs and is made of 100% recycled electrons.